When choosing furniture for senior living facilities, there must be careful consideration and attention to the fabric selection, design and functionality of the furniture, and whether the material is compliant with health regulations. Each of these aspects plays a significant role in the daily life of both the residents and the staff members whether it means offering ease of maintenance or ease of movement. 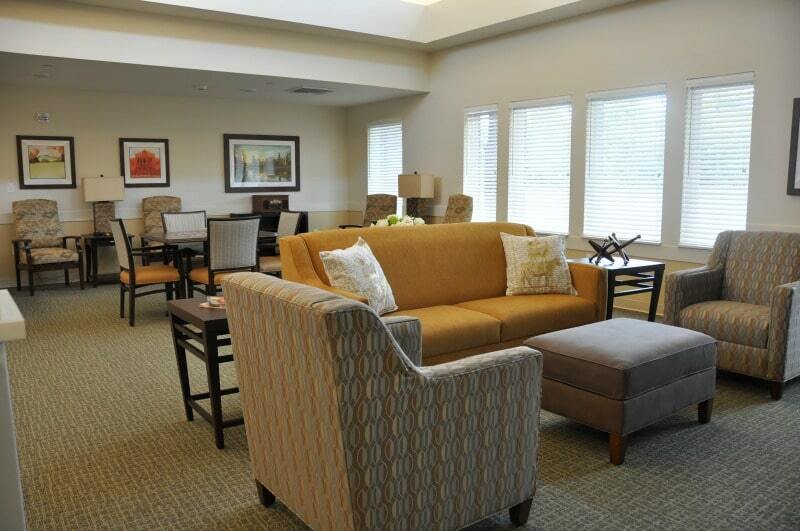 Here are a few things we consider when choosing the best senior living facility furniture for staff and residents. When selecting a couch or piece of furniture that involves a fabric material, it’s often suggested to choose one that is easy to clean and low maintenance. We recommend selecting one that is stain resistant and has a high wear resistance for healthcare and hospital use. At Warner Design Associates, we suggest selecting a fabric design that is simple, has little to no patterns, and has a contrasting color to the walls so that it’s easily distinguishable. Colors can play an important role in the health and wellness of seniors so if you’re unsure of what color to choose, learn more about the most popular colors used by senior living communities here. Furniture designed for seniors should have functionality at top of mind. The material needs to be strong, durable, and supportive since many seniors rely on it to assist their everyday movements. Many will rely on the furniture when they need support standing up, sitting down, or walking between rooms. To aid their efforts, we suggest avoiding anything with glass and sharp edges. Standard sized chairs or love seats are also preferred over sofas since they have an armrest offering excellent support to aid movement transitions. In regards to shape and angles, our staff often prefers circular pieces of furniture or soft edges. When selecting a table for example, a rectangular dining table with eased corners is best. The material of furniture used in senior living communities is a decision that should not be taken lightly as there are strict healthcare laws in place that your community may be subject to such as the Prevention of Hospital Acquired Infections (HAIs). Our team members at Warner Design Associates can help you look into different furniture providers or finishings that are compliant for use in senior living facilities, continuing care retirement communities (CCRC), life planned communities (LPC), assisted living facilities (AL), memory support unities (MSU), and skilled nursing units. For example, KWALU furniture is purposefully designed for healthcare environments to prevent infection and to last. Their products are made of a high impact-resilient polymer and patented joint construction. They don’t have surface joints or seams, and they don’t support microbial growth. For these reasons, it’s an excellent option for senior living communities. If you’re looking for wood style furniture, we suggest choosing one with special treatments. For example, Fairfield Senior Living’s Standard lacquer finish has UV inhibitors to reduce harmful effects of sunlight along with a silver ion technology to provide antimicrobial protection. It also inhibits the growth of mold, mildew, fungus, and other surface bacteria. While the color, design, and material are all important, at the end of the day the furniture needs to be designed for lasting comfort and thus made with quality. It is meant for everyday living for both the staff members and the residents so it should look like it belongs in someone’s home rather than a hospital. If you have any questions regarding the furniture selections available for senior living communities and our suggestions, our team is happy to help. Feel free to contact us and check out our portfolio here.